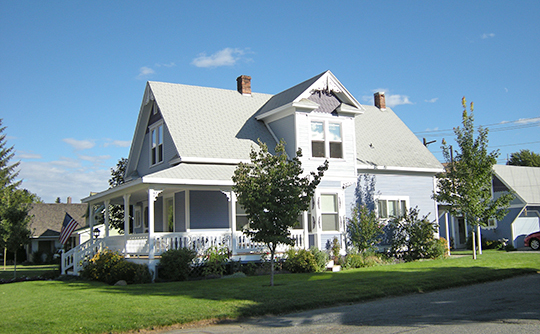 Photo: Home in the Cottage Avenue Historic District, Cashmere, WA. The Historic District was listed on the National Register of Historic Places in 2002. Photographed by Joe Mabel (own work), 2008, [cc-by-3.0 (creativecommons.org/licenses/by/3.0)], via Wikimedia Commons, accessed September, 2017. The region was historically inhabited by the Chelan and Wenatchi Native American tribes, who were included in the Consolidated Tribes and Bands of the Yakima Nation when the Yakima Treaty was signed. A few small areas near Lake Chelan were allotted to the tribe. Most Wenatchis and Chelans settled on the Colville Reservation. European settlers came to the Wenatchee Valley in the 1870s and 1880s. Development arrived with the Great Northern Railway that accessed the Wenatchee Valley with a tunnel through the Cascades near Stevens Pass. Wenatchee incorporated in 1892, soon after the first train passed through the area. Chelan County was created in 1899 with Wenatchee as the county seat. Railroads played a major role in the growth of the area, bringing both supplies and settlers. This growth needed water, and irrigation canals became the center of agricultural success in Chelan County. The ability to form public utility districts in 1930 allowed residents to own power companies. In the same time period, the United States started building irrigation and flood control dams on the Columbia. In 1937 the Bonneville Power Administration was created to distribute electricity to publicly owned utilities. That same year the Chelan County PUD formed. Since then, the PUD has acquired and operates multiple dams in Chelan County. Leavenworth, one community in Chelan County, was struggling economically in the 1960's and decided to pursue a Bavarian theme. Leavenworth continued to grow as a tourist destination, while Wenatchee and Lake Chelan continued to focus on apple orchards. Wenatchee became known as the "Apple Capital." The existing diversity of fruit crops has been enhanced by blueberries and wine grape crops. The wine economy is bringing more tourists to Chelan County, adding to those who already visit the area because of its abundant public open spaces and dramatic geography. Chelan County Comprehensive Plan, 2000 (amended 2016). www.co.chelan.wa.us, accessed September, 2017.